Highlights of the Collection include 19 paintings by Pop Surrealist Aaron Marshall; Shag’s 1997 painting “Religious Icon 2;” “Crown of Bunnies,” the first oil painting by Frank Kozik; “Priscilla Ua,” widely considered to be one of Pizz’s top five works along with rare paintings by Alan Forbes, Marco Almera, Von Franco, Derek Yaniger, BigToe, Gustavo Rimada. A two-decade collection of paintings by Poster Pop artists including Aaron Marshall, Marco Almera, Alan Forbes, Pizz, Shag, Dirty Donny, Frank Kozik and Von Franco will be on display and for sale, for the first time. Highlights of the Collection include 19 paintings by Pop Surrealist Aaron Marshall; Shag’s 1997 painting “Religious Icon 2;” “Crown of Bunnies,” the first oil painting by Frank Kozik; “Priscilla Ua,” widely considered to be one of Pizz’s top five works along with rare paintings by Alan Forbes and Marco Almera. Poster Pop is located in Huntington Beach. Additional show info and images forthcoming. 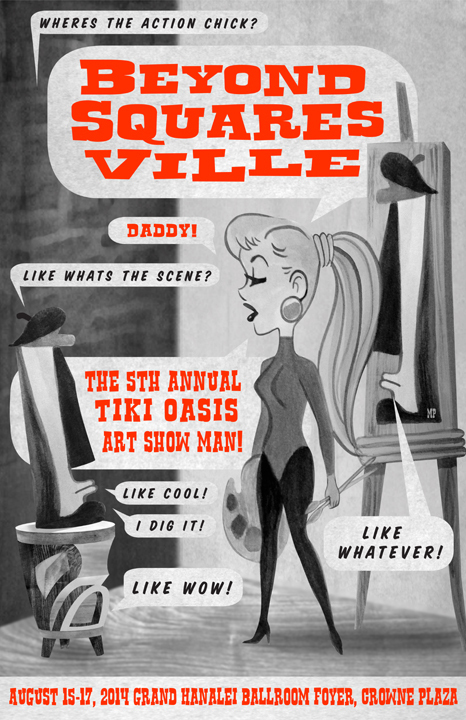 Artist Reception: Meet the Tiki Oasis Artist and the Winner of the Miss Tiki Oasis Contest!